It has been suggested that Christian Science practitioner be merged into this article. (Discuss) Proposed since August 2018. "Faith healer" redirects here. For the play by Brian Friel, see Faith Healer. A scene from Peter of Verona's life: a mute man is miraculously healed. Detail from the relief on the back side of Peter of Verona's grave in the Portinari Chapel in Basilica of Sant'Eustorgio in Milan, Italy. Faith healing is the practice of prayer and gestures (such as laying on of hands) that are believed by some to elicit divine intervention in spiritual and physical healing, especially the Christian practice. Believers assert that the healing of disease and disability can be brought about by religious faith through prayer and/or other rituals that, according to adherents, can stimulate a divine presence and power. Religious belief in divine intervention does not depend on empirical evidence that faith healing achieves an evidence-based outcome. Claims "attributed to a myriad of techniques" such as prayer, divine intervention, or the ministrations of an individual healer can cure illness have been popular throughout history. There have been claims that faith can cure blindness, deafness, cancer, AIDS, developmental disorders, anemia, arthritis, corns, defective speech, multiple sclerosis, skin rashes, total body paralysis, and various injuries. Recoveries have been attributed to many techniques commonly classified as faith healing. It can involve prayer, a visit to a religious shrine, or simply a strong belief in a supreme being. Many people interpret the Bible, especially the New Testament, as teaching belief in, and the practice of, faith healing. According to a 2004 Newsweek poll, 72 percent of Americans said they believe that praying to God can cure someone, even if science says the person has an incurable disease. Unlike faith healing, advocates of spiritual healing make no attempt to seek divine intervention, instead believing in divine energy. The increased interest in alternative medicine at the end of the 20th century has given rise to a parallel interest among sociologists in the relationship of religion to health. Virtually all[a] scientists and philosophers dismiss faith healing as pseudoscience. Faith healing can be classified as a spiritual, supernatural, or paranormal topic, and, in some cases, belief in faith healing can be classified as magical thinking. The American Cancer Society states "available scientific evidence does not support claims that faith healing can actually cure physical ailments". "Death, disability, and other unwanted outcomes have occurred when faith healing was elected instead of medical care for serious injuries or illnesses." When parents have practiced faith healing rather than medical care, many children have died that otherwise would have been expected to live. Similar results are found in adults. Regarded as a Christian belief that God heals people through the power of the Holy Spirit, faith healing often involves the laying on of hands. It is also called supernatural healing, divine healing, and miracle healing, among other things. Healing in the Bible is often associated with the ministry of specific individuals including Elijah, Jesus and Paul. Christian physician Reginald B. Cherry views faith healing as a pathway of healing in which God uses both the natural and the supernatural to heal. Being healed has been described as a privilege of accepting Christ's redemption on the cross. Pentecostal writer Wilfred Graves, Jr. views the healing of the body as a physical expression of salvation. Matthew 8:17, after describing Jesus exorcising at sunset and healing all of the sick who were brought to him, quotes these miracles as a fulfillment of the prophecy in Isaiah 53:5: "He took up our infirmities and carried our diseases". Even those Christian writers who believe in faith healing do not all believe that one's faith presently brings about the desired healing. "[Y]our faith does not effect your healing now. When you are healed rests entirely on what the sovereign purposes of the Healer are." Larry Keefauver cautions against allowing enthusiasm for faith healing to stir up false hopes. "Just believing hard enough, long enough or strong enough will not strengthen you or prompt your healing. Doing mental gymnastics to 'hold on to your miracle' will not cause your healing to manifest now." Those who actively lay hands on others and pray with them to be healed are usually aware that healing may not always follow immediately. Proponents of faith healing say it may come later, and it may not come in this life. "The truth is that your healing may manifest in eternity, not in time". Parts of the four gospels in the New Testament say that Jesus cured physical ailments well outside the capacity of first-century medicine. One example is the case of "a woman who had had a discharge of blood for twelve years, and who had suffered much under many physicians, and had spent all that she had, and was not better but rather grew worse". [Mark 5:26–27] After healing her, Jesus tells her "Daughter, your faith has made you well. Go in peace! Be cured from your illness". [Mark 5:34] At least two other times Jesus credited the sufferer's faith as the means of being healed: Mark 10:52 and Luke 19:10. Jesus endorsed the use of the medical assistance of the time (medicines of oil and wine) when he told the parable of the Good Samaritan (Luke 10:25-37), who "bound up [an injured man's] wounds, pouring on oil and wine" (verse 34) as a physician would. Jesus then told the doubting teacher of the law (who had elicited this parable by his self-justifying question, "And who is my neighbor?" in verse 29) to "go, and do likewise" in loving others with whom he would never ordinarily associate (verse 37). The healing in the gospels is referred to as a "sign"[John 6:2] to prove Jesus' divinity and to foster belief in him as the Christ. [John 4:48] However, when asked for other types of miracles, Jesus refused some[Matthew 12:38-42] but granted others[Luke 9:38–43] in consideration of the motive of the request. Some theologians' understanding is that Jesus healed all who were present every single time. Sometimes he determines whether they had faith that he would heal them. The apostle Paul believed healing is one of the special gifts of the Holy Spirit,[1 Corinthians 12:9] and that the possibility exists that certain persons may possess this gift to an extraordinarily high degree. In the New Testament Epistle of James,[5:14] the faithful are told that to be healed, those who are sick should call upon the elders of the church to pray over [them] and anoint [them] with oil in the name of the Lord. The New Testament says that during Jesus' ministry and after his Resurrection, the apostles healed the sick and cast out demons, made lame men walk, raised the dead and performed other miracles. Jesus used miracles to convince people that he was inaugurating the Messianic Age. as in Mt 12.28. Scholars have described Jesus' miracles as establishing the kingdom during his lifetime. Faith healing is reported by Catholics as the result of intercessory prayer to a saint or to a person with the gift of healing. According to U.S. Catholic magazine, "Even in this skeptical, postmodern, scientific age—miracles really are possible." Three-fourths of American Catholics say they pray for miracles. According to John Cavadini, when healing is granted, "The miracle is not primarily for the person healed, but for all people, as a sign of God's work in the ultimate healing called 'salvation', or a sign of the kingdom that is coming." Some might view their own healing as a sign they are particularly worthy or holy, while others do not deserve it. The Catholic Church has a special Congregation dedicated to the careful investigation of the validity of alleged miracles attributed to prospective saints. Pope Francis tightened the rules on money and miracles in the canonization process. Since Catholic Christians believe the lives of canonized saints in the Church will reflect Christ's, many have come to expect healing miracles. While the popular conception of a miracle can be wide-ranging, the Catholic Church has a specific definition for the kind of miracle formally recognized in a canonization process. As of 2004[update], Catholic medics have asserted that there have been 67 miracles and 7,000 unexplainable medical cures at Lourdes since 1858. In a 1908 book, it says these cures were subjected to intense medical scrutiny and were only recognized as authentic spiritual cures after a commission of doctors and scientists, called the Lourdes Medical Bureau, had ruled out any physical mechanism for the patient's recovery. At the beginning of the 20th century, the new Pentecostal movement drew participants from the Holiness movement and other movements in America that already believed in divine healing. By the 1930s, several faith healers drew large crowds and established worldwide followings. The first Pentecostals in the modern sense appeared in Topeka, Kansas, in a Bible school conducted by Charles Fox Parham, a holiness teacher and former Methodist pastor. Pentecostalism achieved worldwide attention in 1906 through the Azusa Street Revival in Los Angeles led by William Joseph Seymour. Smith Wigglesworth was also a well-known figure in the early part of the 20th century. A former English plumber turned evangelist who lived simply and read nothing but the Bible from the time his wife taught him to read, Wigglesworth traveled around the world preaching about Jesus and performing faith healings. Wigglesworth claimed to raise several people from the dead in Jesus' name in his meetings. During the 1920s and 1930s, Aimee Semple McPherson was a controversial faith healer of growing popularity during the Great Depression. Subsequently, William M. Branham has been credited as the initiater of the post-World War II healing revivals. (p58)(p25) The healing revival he began led many to emulate his style and spawned a generation of faith healers. Because of this, Branham has been recognized as the "father of modern faith healers". According to writer and researcher Patsy Sims, "the power of a Branham service and his stage presence remains a legend unparalleled in the history of the Charismatic movement". By the late 1940s, Oral Roberts, who was associated with and promoted by Branham's Voice of Healing magazine also became well known, and he continued with faith healing until the 1980s. 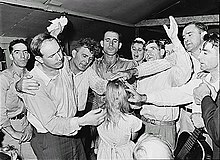 Roberts discounted faith healing in the late 1950s, stating, "I never was a faith healer and I was never raised that way. My parents believed very strongly in medical science and we have a doctor who takes care of our children when they get sick. I cannot heal anyone – God does that." A friend of Roberts was Kathryn Kuhlman, another popular faith healer, who gained fame in the 1950s and had a television program on CBS. Also in this era, Jack Coe and A. A. Allen were faith healers who traveled with large tents for large open-air crusades. Oral Roberts's successful use of television as a medium to gain a wider audience led others to follow suit. His former pilot, Kenneth Copeland, started a healing ministry. Pat Robertson, Benny Hinn, and Peter Popoff became well-known televangelists who claimed to heal the sick. Richard Rossi is known for advertising his healing clinics through secular television and radio. Kuhlman influenced Benny Hinn, who adopted some of her techniques and wrote a book about her. An important point in Christian Science is that effectual prayer and the moral regeneration of one's life go hand-in-hand: that "signs and wonders are wrought in the metaphysical healing of physical disease; but these signs are only to demonstrate its divine origin, to attest the reality of the higher mission of the Christ-power to take away the sins of the world." Christian Science teaches that disease is mental, a mortal fear, a mistaken belief or conviction of the necessity and power of ill-health – an ignorance of God's power and goodness. The chapter "Prayer" in Science and Health with Key to the Scriptures gives a full account of healing through prayer, while the testimonies at the end of the book are written by people who believe they have been healed through spiritual understanding gained from reading the book. The Church of Jesus Christ of Latter-day Saints (LDS) has had a long history of faith healings. Many members of the LDS Church have told their stories of healing within the LDS publication, the Ensign. The church believes healings come most often as a result of priesthood blessings given by the laying on of hands; however, prayer often accompanied with fasting is also thought to cause healings. Healing is always attributed to be God's power. Latter-day Saints believe that the Priesthood of God, held by prophets (such as Moses) and worthy disciples of the Savior, was restored via heavenly messengers to the first prophet of this dispensation, Joseph Smith. According to LDS doctrine, even though members may have the restored priesthood authority to heal in the name of Jesus Christ, all efforts should be made to seek the appropriate medical help. Brigham Young stated this effectively, while also noting that the ultimate outcome is still dependent on the will of God. If we are sick, and ask the Lord to heal us, and to do all for us that is necessary to be done, according to my understanding of the Gospel of salvation, I might as well ask the Lord to cause my wheat and corn to grow, without my plowing the ground and casting in the seed. It appears consistent to me to apply every remedy that comes within the range of my knowledge, and to ask my Father in Heaven, in the name of Jesus Christ, to sanctify that application to the healing of my body. But suppose we were traveling in the mountains, ... and one or two were taken sick, without anything in the world in the shape of healing medicine within our reach, what should we do? According to my faith, ask the Lord Almighty to … heal the sick. This is our privilege, when so situated that we cannot get anything to help ourselves. Then the Lord and his servants can do all. But it is my duty to do, when I have it in my power. We lay hands on the sick and wish them to be healed, and pray the Lord to heal them, but we cannot always say that he will. Reciting the Quran over water or olive oil and drinking, bathing or anointing oneself with it. Placing the right hand on a place that is in pain, or placing the right hand on the forehead and reciting Sura Al-Fatiha. These methods are referred to as ruqyah (Exorcism). Some critics of Scientology have referred to some of its practices as being similar to faith healing, based on claims made by L. Ron Hubbard in Dianetics: The Modern Science of Mental Health and other writings. Nearly all[a] scientists dismiss faith healing as pseudoscience. Some opponents of the pseudoscience label assert that faith healing makes no scientific claims and thus should be treated as a matter of faith that is not testable by science. Critics reply that claims of medical cures should be tested scientifically because, although faith in the supernatural is not in itself usually considered to be the purview of science,[e] claims of reproducible effects are nevertheless subject to scientific investigation. Scientists and doctors generally find that faith healing lacks biological plausibility or epistemic warrant,:30-31 which is one of the criteria to used to judge whether clinical research is ethical and financially justified. A Cochrane review of intercessory prayer found "although some of the results of individual studies suggest a positive effect of intercessory prayer, the majority do not". The authors concluded: "We are not convinced that further trials of this intervention should be undertaken and would prefer to see any resources available for such a trial used to investigate other questions in health care". A review in 1954 investigated spiritual healing, therapeutic touch and faith healing. Of the hundred cases reviewed, none revealed that the healer's intervention alone resulted in any improvement or cure of a measurable organic disability. In addition, at least one study has suggested that adult Christian Scientists, who generally use prayer rather than medical care, have a higher death rate than other people of the same age. The Global Medical Research Institute (GMRI) was created in 2012 to start collecting medical records of patients who claim to have received a supernatural healing miracle as a result of Christian Spiritual Healing practices. The organization has a panel of medical doctors who review the patient’s records looking at entries prior to the claimed miracles and entries after the miracle was claimed to have taken place. “The overall goal of GMRI is to promote an empirically grounded understanding of the physiological, emotional, and sociological effects of Christian Spiritual Healing practices”. This is accomplished by applying the same rigorous standards used in other forms of medical and scientific research. "I have visited Lourdes in France and Fatima in Portugal, healing shrines of the Christian Virgin Mary. I have also visited Epidaurus in Greece and Pergamum in Turkey, healing shrines of the pagan god Asklepios. The miraculous healings recorded in both places were remarkably the same. There are, for example, many crutches hanging in the grotto of Lourdes, mute witness to those who arrived lame and left whole. There are, however, no prosthetic limbs among them, no witnesses to paraplegics whose lost limbs were restored." Skeptics of faith healing offer primarily two explanations for anecdotes of cures or improvements, relieving any need to appeal to the supernatural. [f] The first is post hoc ergo propter hoc, meaning that a genuine improvement or spontaneous remission may have been experienced coincidental with but independent from anything the faith healer or patient did or said. These patients would have improved just as well even had they done nothing. The second is the placebo effect, through which a person may experience genuine pain relief and other symptomatic alleviation. In this case, the patient genuinely has been helped by the faith healer or faith-based remedy, not through any mysterious or numinous function, but by the power of their own belief that they would be healed. [g] In both cases the patient may experience a real reduction in symptoms, though in neither case has anything miraculous or inexplicable occurred. Both cases, however, are strictly limited to the body's natural abilities. ... available scientific evidence does not support claims that faith healing can actually cure physical ailments... One review published in 1998 looked at 172 cases of deaths among children treated by faith healing instead of conventional methods. These researchers estimated that if conventional treatment had been given, the survival rate for most of these children would have been more than 90 percent, with the remainder of the children also having a good chance of survival. A more recent study found that more than 200 children had died of treatable illnesses in the United States over the past thirty years because their parents relied on spiritual healing rather than conventional medical treatment. The American Medical Association considers that prayer as therapy should not be a medically reimbursable or deductible expense. Belgian philosopher and skeptic Etienne Vermeersch coined the term Lourdes effect as a criticism of the magical thinking and placebo effect possibilities for the claimed miraculous cures as there are no documented events where a severed arm has been reattached through faith healing at Lourdes. Vermeersch identifies ambiguity and equivocal nature of the miraculous cures as a key feature of miraculous events. Reliance on faith healing to the exclusion of other forms of treatment can have a public health impact when it reduces or eliminates access to modern medical techniques. [h][i][j] This is evident in both higher mortality rates for children and in reduced life expectancy for adults. Critics have also made note of serious injury that has resulted from falsely labelled "healings", where patients erroneously consider themselves cured and cease or withdraw from treatment. [k] For example, at least six people have died after faith healing by their church and being told they had been healed of HIV and could stop taking their medications. It is the stated position of the AMA that "prayer as therapy should not delay access to traditional medical care". Choosing faith healing while rejecting modern medicine can and does cause people to die needlessly. Christian theological criticism of faith healing broadly falls into two distinct levels of disagreement. The first is widely termed the "open-but-cautious" view of the miraculous in the church today. This term is deliberately used by Robert L. Saucy in the book Are Miraculous Gifts for Today?. Don Carson is another example of a Christian teacher who has put forward what has been described as an "open-but-cautious" view. In dealing with the claims of Warfield, particularly "Warfield's insistence that miracles ceased", Carson asserts, "But this argument stands up only if such miraculous gifts are theologically tied exclusively to a role of attestation; and that is demonstrably not so." However, while affirming that he does not expect healing to happen today, Carson is critical of aspects of the faith healing movement, "Another issue is that of immense abuses in healing practises.... The most common form of abuse is the view that since all illness is directly or indirectly attributable to the devil and his works, and since Christ by his cross has defeated the devil, and by his Spirit has given us the power to overcome him, healing is the inheritance right of all true Christians who call upon the Lord with genuine faith." The second level of theological disagreement with Christian faith healing goes further. Commonly referred to as cessationism, its adherents either claim that faith healing will not happen today at all, or may happen today, but it would be unusual. Richard Gaffin argues for a form of cessationism in an essay alongside Saucy's in the book Are Miraculous Gifts for Today? In his book Perspectives on Pentecost Gaffin states of healing and related gifts that "the conclusion to be drawn is that as listed in 1 Corinthians 12(vv. 9f., 29f.) and encountered throughout the narrative in Acts, these gifts, particularly when exercised regularly by a given individual, are part of the foundational structure of the church... and so have passed out of the life of the church." Gaffin qualifies this, however, by saying "At the same time, however, the sovereign will and power of God today to heal the sick, particularly in response to prayer (see e.g. James 5:14,15), ought to be acknowledged and insisted on." Skeptics of faith healers point to fraudulent practices either in the healings themselves (such as plants in the audience with fake illnesses), or concurrent with the healing work supposedly taking place and claim that faith healing is a quack practice in which the "healers" use well known non-supernatural illusions to exploit credulous people in order to obtain their gratitude, confidence and money. James Randi's The Faith Healers investigates Christian evangelists such as Peter Popoff, who claimed to heal sick people on stage in front of an audience. Popoff pretended to know private details about participants' lives by receiving radio transmissions from his wife who was off-stage and had gathered information from audience members prior to the show. According to this book, many of the leading modern evangelistic healers have engaged in deception and fraud. The book also questioned how faith healers use funds that were sent to them for specific purposes. [l] Physicist Robert L. Park and doctor and consumer advocate Stephen Barrett have called into question the ethics of some exorbitant fees. There have also been legal controversies. For example, in 1955 at a Jack Coe revival service in Miami, Florida, Coe told the parents of a three-year-old boy that he healed their son who had polio. Coe then told the parents to remove the boy's leg braces. However, their son was not cured of polio and removing the braces left the boy in constant pain. As a result, through the efforts of Joseph L. Lewis, Coe was arrested and charged on February 6, 1956 with practicing medicine without a license, a felony in the state of Florida. A Florida Justice of the Peace dismissed the case on grounds that Florida exempts divine healing from the law. Later that year Coe was diagnosed with bulbar polio, and died a few weeks later at Dallas' Parkland Hospital on December 17, 1956. TV personality Derren Brown produced a show on faith healing entitled "Miracles for sale" which arguably exposed the art of faith healing as a scam. In this show, Derren trained a scuba diver trainer picked from the general public to be a faith healer and took him to Texas to successfully deliver a faith healing session to a congregation. "(1) as establishing a Federal requirement that a parent or legal guardian provide a child any medical service or treatment against the religious beliefs of the parent or legal guardian; and "(2) to require that a State find, or to prohibit a State from finding, abuse or neglect in cases in which a parent or legal guardian relies solely or partially upon spiritual means rather than medical treatment, in accordance with the religious beliefs of the parent or legal guardian. "(b) State Requirement. – Notwithstanding subsection (a), a State shall, at a minimum, have in place authority under State law to permit the child protective services system of the State to pursue any legal remedies, including the authority to initiate legal proceedings in a court of competent jurisdiction, to provide medical care or treatment for a child when such care or treatment is necessary to prevent or remedy serious harm to the child, or to prevent the withholding of medically indicated treatment from children with life threatening conditions. Except with respect to the withholding of medically indicated treatments from disabled infants with life threatening conditions, case by case determinations concerning the exercise of the authority of this subsection shall be within the sole discretion of the State. Thirty-one states have child-abuse religious exemptions. These are Alabama, Alaska, California, Colorado, Delaware, Florida, Georgia, Idaho, Illinois, Indiana, Iowa, Kansas, Kentucky, Louisiana, Maine, Michigan, Minnesota, Mississippi, Missouri, Montana, Nevada, New Hampshire, New Jersey, New Mexico, Ohio, Oklahoma, Oregon, Pennsylvania, Vermont, Virginia, and Wyoming. In six of these states, Arkansas, Idaho, Iowa, Louisiana, Ohio and Virginia, the exemptions extend to murder and manslaughter. Of these, Idaho is the only state accused of having a large number of deaths due to the legislation in recent times. In February 2015, controversy was sparked in Idaho over a bill believed to further reinforce parental rights to deny their children medical care. Parents have been convicted of child abuse and felony reckless negligent homicide and found responsible for killing their children when they withheld lifesaving medical care and chose only prayers. ^ According to a Catholic Encyclopedia article about psychotherapy from 1911, the application of scientific principles has probably been the responsible cause of more faith cures than anything else. Faith in a scientific discovery acts through the mind of a patient to bring about an improvement of symptoms, if not a cure of the disease. The patients who are cured usually suffer from chronic conditions, they either have only a persuasion that they are ill or have some physical ailment, but the patients inhibit through solicitude and worry the natural forces that would bring about a cure. This inhibition cannot be lifted until the mind is relieved by confidence in a remedy or scientific discovery that gives them a conviction of cure. ^ A pre-1911 analysis of the records of cures shows that the majority of accepted cures have been in patients suffering from demonstrable physical conditions. ^ This is not "intercessory" prayer, but recognition of the good believed to be already present behind the illusory appearance, and gratitude for that good. While Christian Scientists are under no compulsion to choose prayer in preference to material medicine, they normally choose not to combine the two, in the belief that they tend to work against each other if used simultaneously. ^ "The "faith" in faith healing refers to an irrational belief, unsupported by evidence, that mysterious supernatural powers can eradicate disease. Science deals with evidence, not faith." Bruce Flamm, 2004. ^ "Faith healing". thearda.com. University Park, PA: Association of Religion Data Archives. Archived from the original on 2016-01-01. Retrieved 2015-10-24. Citing Smith, Jonathan; Green, William Scott, eds. (1995). The Harper Collins Dictionary of Religion. San Francisco, CA: HarperCollins. p. 355. ^ a b c Village, Andrew (2005). "Dimensions of belief about miraculous healing". Mental Health, Religion & Culture. 8 (2): 97–107. doi:10.1080/1367467042000240374. ^ a b c d Barrett, Stephen (December 27, 2009). "Some Thoughts about Faith Healing". Quackwatch. Archived from the original on 2014-02-09. Retrieved 2014-01-23. ^ a b c d e "Faith Healing". American Cancer Society. 2013-01-17. Archived from the original on 2013-04-27. ^ Kalb, Claudia (2004-11-10). "Can religion improve health? While the debate rages in journals and med schools, more Americans ask for doctors' prayers". Newsweek. Archived from the original on 2004-02-03. Retrieved 2015-09-11 – via msn.com. ^ a b c d Mahner, Martin (2013). Pigliucci, Massimo; Boudry, Maarten (eds.). Philosophy of pseudoscience reconsidering the demarcation problem (Online-Ausg. ed.). Chicago: University of Chicago Press. p. 30. ISBN 9780226051826. Retrieved 18 April 2018. ^ a b c Hassani, Sadri (2010). From Atoms to Galaxies: A Conceptual Physics Approach to Scientific Awareness. CRC Press. p. 641. ISBN 9781439882849. Retrieved 18 April 2018. There are also activities that, although not classified (or claimed) as science, have implications that trespass into the scientific territories. Examples of this category of activities are the claim that we have been visited by aliens riding unidentified flying objects, all psychic phenomena, and faith healing. We study the nature of all these activities under the general heading of pseudoscience. . .
^ a b Erzinclioglu, Zakaria (2000). Every Contact Leaves a Trace: Scientific Detection in the Twentieth Century. Carlton Books. p. 60. ISBN 9781842221617. For example, most scientists dismiss the notion of faith-healing, a phenomenon for which there is a certain amount of evidence. Pitt, Joseph C.; Pera, Marcello (2012). Rational Changes in Science: Essays on Scientific Reasoning. Springer Science & Business Media. ISBN 9789400937796. Retrieved 18 April 2018. Such examples of pseudoscience as the theory of biorhythms, astrology, dianetics, creationism, faith healing may seem too obvious examples of pseudoscience for academic readers. Zerbe, Michael J. (2007). Composition and the Rhetoric of Science: Engaging the Dominant Discourse. SIU Press. p. 86. ISBN 9780809327409. [T]he authors of the 2002 National Science Foundation Science and Engineering Indicators devoted and entire section of their report to the concern that the public is increasingly trusting in pseudoscience such as astrology, UFOs and alien abduction, extrasensory perception, channeling the dead, faith healing, and psychic hotlines. Robert Cogan (1998). Critical Thinking: Step by Step. University Press of America. p. 217. ISBN 9780761810674. Faith healing is probably the most dangerous pseudoscience. Leonard, Bill J.; Crainshaw, Jill Y. (2013). Encyclopedia of Religious Controversies in the United States: A-L. ABC-CLIO. ISBN 9781598848670. Retrieved 18 April 2018. Certain approaches to faith healing are also widely considered to be pseudoscientific, including those of Christian Science, voodoo, and Spiritualism. ^ Walker, Barbara; McClenon, James (October 1995). "6". Out of the Ordinary: Folklore and the supernatural. Utah State University Press. pp. 107–121. ISBN 978-0-87421-196-2. Retrieved May 19, 2015. Supernatural experiences provide a foundation for spiritual healing. The concept supernatural is culturally specific, since some societies regard all perceptions as natural; yet certain events-such as apparitions, out-of-body and near-death experiences, extrasensory perceptions, precognitive dreams, and contact with the dead-promote faith in extraordinary forces. Supernatural experiences can be defined as those sensations directly supporting occult beliefs. Supernatural experiences are important because they provide an impetus for ideologies supporting occult healing practices, the primary means of medical treatment throughout antiquity. ^ Martin, M (1994). "Pseudoscience, the paranormal, and science education" (PDF). Science and Education. 3 (4): 357–71. Bibcode:1994Sc&Ed...3..357M. doi:10.1007/BF00488452. Cures allegedly brought about by religious faith are, in turn, considered to be paranormal phenomena but the related religious practices and beliefs are not pseudoscientific since they usually have no scientific pretensions. ^ Lesser, R; Paisner, M (March–April 1985). "Magical thinking in Formal Operational adults". Human Development. 28 (2): 57–70. doi:10.1159/000272942. ^ a b Asser, Seth M.; Swan, Rita (April 1998). "Child fatalities from religion-motivated medical neglect" (PDF). Pediatrics. 101 (4): 625–629. doi:10.1542/peds.101.4.625. PMID 9521945. Retrieved 2007-11-19. ^ a b Simpson, William F. (1989). "Comparative longevity in a college cohort of Christian Scientists". JAMA. 262 (12): 1657–8. doi:10.1001/jama.1989.03430120111031. PMID 2769921. ^ Cherry, Reginald B. (1999) . The Bible Cure (reprint ed.). HarperOne. ISBN 978-0062516152. [page needed] Citing: John 9:1–7 and Mark 10:46–52. ^ Bosworth 2001, p. 32. ^ Graves, Wilfred, Jr. (2011). In Pursuit of Wholeness: Experiencing God's Salvation for the Total Person. Shippensburg, PA: Destiny Image. p. 52. ISBN 9780768437942. ^ a b c Keefauver, Larry (June 17, 2009). "The myths of faith healing". Charisma. Archived from the original on 2009-05-11. ^ Booth, Craig W. (December 16, 2003). "Faith Healing – God's Compassion, God's Power, and God's Sovereignty: Is a Christian permitted to seek medical assistance and to use medicine?". thefaithfulword.org. Retrieved 2007-05-01. ^ Bosworth 2001, p. 61. ^ Price, Charles P. (2009). "Faith Healing". Microsoft Encarta Online Encyclopedia. Archived from the original on 2009-11-01. ^ Brown, Raymond E.; et al. (1990). "78:20; 81:106,112,113,117". The New Jerome Biblical Commentary. Englewood Cliffs, New Jersey: Prentice Hall. ISBN 978-0-13-614934-7. ^ a b Catholic Church. Congregation for the Doctrine of the Faith (2000-09-14). "Instruction on prayers for healing". vatican.va. Vatican City. Archived from the original on 2001-01-24. ^ a b c d e Catholic Church. United States Conference of Catholic Bishops. Committee on Doctrine (2009-03-25). "Guidelines for evaluating Reiki as an alternative therapy" (PDF). usccb.org. Washington, DC: United States Conference of Catholic Bishops. Archived from the original (PDF) on 2014-05-08. Retrieved 2015-11-04. ^ Ascoli, Micol (2009). "Psychotherapy or religious healing? : the 'therapeutic' cult of charismatic Catholics in Italy". In Incayawar, Mario; Wintrob, Ronald; Bouchard, Lise (eds.). Psychiatrist and traditional healers : unwitting partners in global mental health. WPA series, evidence and experience in psychiatry. Hoboken, NJ: J. Wiley & Sons. pp. 229–236. doi:10.1002/9780470741054.ch18. ISBN 9780470741054. ^ a b c One or more of the preceding sentences incorporates text from a publication now in the public domain: Walsh, James J. (1911). "Psychotherapy". In Herbermann, Charles (ed.). Catholic Encyclopedia. 12. New York: Robert Appleton. ^ a b Scanlon, Leslie (June 2009). "It's a miracle!". U.S. Catholic. 74 (6). p. 12. ^ "Vatican tightens rules on miracles and money in sainthood cases". Crux. 2016-09-23. Retrieved 2017-04-26. ^ Pinches, Charles (2007). "Miracles: A Christian theological overview". Southern Medical Journal. 100 (12): 1236–42. doi:10.1097/SMJ.0b013e31815843cd. PMID 18090969. ^ One or more of the preceding sentences incorporates text from a publication now in the public domain: Bertrin, Georges (1910). "Notre-Dame de Lourdes". In Herbermann, Charles (ed.). Catholic Encyclopedia. 9. New York: Robert Appleton. ^ "How Lourdes cures are recognized as miraculous". ZENIT Daily Dispatch. Zenit News Agency. February 11, 2004. Retrieved 2007-12-14 – via ewtn.com. Citing Associazione Medici Cattolici Italiani. Sezione di Milano, ed. (2004). Il medico di fronte al miracolo. Convegno promosso dall'A.M.C.I. tenuto a Milano il 23 novembre 2002 (in Italian). Cinisello Balsamo, IT: Edizioni Paoline. ISBN 9788821550607. ^ Bertrin, Georges (1908). Lourdes: a history of its apparitions and cures. Translated by Agnes Mary Rowland Gibbs. New York [u.a. ]: Benziger Brothers. hdl:2027/nnc1.0020343540. OCLC 679304003. ^ Synan, Vinson (14 June 2009). "The Origins of the Pentecostal Movement". Holy Spirit Research Center, Oral Roberts University. ^ Posner, Sarah; Conason, Joe (2008). God's Profits: Faith, Fraud, and the Republican Crusade for Values Voters. Polipoint Press. p. 67. ISBN 978-0979482212. ^ Anderson, Allan (2004). An introduction to Pentecostalism: global charismatic Christianity. Cambridge [u.a. ]: Cambridge University Press. ISBN 9780521532808. ^ Harrell, David E. (1975). All things are possible: the healing and charismatic revivals in modern America. Bloomington, IN: Indiana University Press. ISBN 9780253100900. ^ Sheryl, J. Greg (2013). "The Legend of William Branham" (PDF). The Quarterly Journal. 33 (3). ISSN 1083-6853. ^ Sims 1996, p. 195. ^ Jones, Charles (January 21, 1958). " 'I've no secrets to hide', says evangelist Roberts". The Miami News. p. 5A. Retrieved 2014-01-23. ^ "7,000 in evangelistic tent sing when lights go out". Pittsburgh Post-Gazette. August 24, 1953. p. 7. Retrieved 2014-01-23. ^ "Evangelist death laid to alcohol". Chronicle-Telegram. Elyria, OH. June 25, 1970. Archived from the original on August 15, 2016. Retrieved 2007-05-17. ^ a b c Randi 1989, p. 10. ^ Nickell, Joe (May–June 2002). "Benny Hinn: Healer or hypnotist?". Skeptical Inquirer. 26.3. Committee for Skeptical Inquiry. Archived from the original on 2013-10-30. ^ Carroll, Robert Todd (January 29, 2014). "Faith Healing". The Skeptic's Dictionary (online ed.). ^ Bergman, Gerald (October 2001). "The Christian Science holocaust". The New England Journal of Skepticism. 4 (4). New England Skeptical Society. ^ Eddy, Mary Baker 1875, "Prayer" pp. 1-17. ^ MBE [Mary Baker Eddy] (June 29, 2012). "Is there no intercessory prayer?". christianscience.org. Study Tools. Healing Unlimited. ^ Eddy, Mary Baker 1875, "Medicine" p. 150. ^ Miller, Brandon J. (September 2001). "I needed a blessing". Latter-day Saint Voices. The Ensign of The Church of Jesus Christ of Latter-day Saints (Ensign). pp. 64–8. ^ Ribeiro, Sérgio (January 2004). "He restoreth my soul". Latter-day Saint Voices. Ensign. pp. 70–3. ^ Heal, Simon (April 2010). "Call an ambulance!". Latter-day Saint Voices. Ensign. pp. 60–3. ^ Peñate de Guerra, Magdalena (September 2005). "We rejoiced in her healing". Latter-day Saint Voices. Ensign. pp. 66–9. ^ "Joseph Smith/Healings and miracles". fairmormon.org. FairMormon. May 23, 2010. Archived from the original on 2010-02-01. Retrieved 2010-09-20. ^ Haokip, Konkhogin (Hagin) (2007). Increasing Knowledge about Divine Healing Within the Leadership of an Immigrant Asian Baptist Church. ProQuest. pp. 53–4. ISBN 9781109065787. ^ Cooper, Paulette. The Scandal of Scientology. ^ a b "Popular Delusions III: Faith Healing". 26 September 2006. Retrieved 30 April 2018. Naturally, this result has provoked bitter complaints from many believers who assert that God should not be put to the test. In response to the MANTRA study, an English bishop said, "Prayer is not a penny in the slot machine. You can't just put in a coin and get out a chocolate bar." Similarly, in a New York Times article on prayer studies from October 10, 2004, Rev. Raymond J. Lawrence Jr. of New York-Presbyterian Hospital is quoted as saying, "There's no way to put God to the test, and that's exactly what you're doing when you design a study to see if God answers your prayers. This whole exercise cheapens religion, and promotes an infantile theology that God is out there ready to miraculously defy the laws of nature in answer to a prayer." ^ Martin, Michael (1994). "Pseudoscience, the Paranormal, and Science Education" (PDF). Science & Education. 3 (3): 364. Bibcode:1994Sc&Ed...3..357M. doi:10.1007/BF00488452. Retrieved 30 March 2018. Cures allegedly brought about by religious faith are, in turn, considered to be paranormal phenomena but the related religious practices and beliefs are not pseudoscientific since they usually have no scientific pretensions. ^ Gould, Stephen Jay (March 1997). "Non-overlapping magisteria". Natural History. 106. pp. 16–22. Re-published in Gould, Stephen Jay (1998). "Non-overlapping magisteria". Leonardo's Mountain of Clams and the Diet of Worms. New York: New Harmony. pp. 269–83. ^ a b Flamm, Bruce (September–October 2004). "The Columbia University 'miracle' study: Flawed and fraud". Skeptical Inquirer. Committee for Skeptical Inquiry. Archived from the original on 2009-11-06. ^ Wendler, David (2017). "The Ethics of Clinical Research". The Stanford Encyclopedia of Philosophy (Winter 2017 ed.). Metaphysics Research Lab, Stanford University. ^ a b Roberts, Leanne; Ahmed, Irshad; Davison, Andrew (15 April 2009). "Intercessory prayer for the alleviation of ill health". Cochrane Database of Systematic Reviews (2): CD000368. doi:10.1002/14651858.CD000368.pub3. PMID 19370557. ^ Rose, Louis (1954). "Some aspects of paranormal healing". The British Medical Journal. 2 (4900): 1329–32. doi:10.1136/bmj.2.4900.1329. PMC 2080217. PMID 13209112. ^ Crossan, John Dominic; Watts, Richard G., eds. (1999) [c. 1996]. Who is Jesus? : Answers to Your Questions About the Historical Jesus (reprint ed.). Louisville, KY: Westminster John Knox. p. 64. ISBN 9780664258429. ^ a b "Complementary and Alternative Therapies for Cancer Patients: Faith Healing". UC San Diego Moores Cancer Center, UC San Diego Health System, University of California, San Diego. Archived from the original on 2008-10-06. Retrieved 2008-01-17. ^ Carroll, Robert Todd (January 8, 2014). "Faith Healing". The Skeptic's Dictionary. ^ a b Park, Robert L. (2000). Voodoo Science: The Road from Foolishness to Fraud. New York: Oxford University Press. pp. 50–1. ISBN 978-0195135152. ^ Humphrey, Nicholas (2002). "Chapter 19: Great Expectations: The Evolutionary Psychology of Faith-Healing and the Placebo Effect" (PDF). The Mind Made Flesh: Essays from the Frontiers of Psychology and Evolution. Oxford University Press. pp. 255–85. ISBN 978-0-19-280227-9. ^ Scientific apriori's against the paranormal Archived 2009-06-19 at the Wayback Machine by Prof. Etienne Vermeersch. ^ Vermeersch, E., Het paranormale ter discussie, Studiumgenerale, nr 9107, Utrecht University, 1992, pp. 81-93 (English title: The paranormal questioned). ^ Vermeersch, E., Epistemologische Inleiding tot een Wetenschap van de Mens, Brugge, De Tempel, 1966. ^ Flamm, Bruce L. (2004). "Inherent Dangers of Faith Healing Studies". Scientific Review of Alternative Medicine. 8 (2). Archived from the original on 2007-08-16. Retrieved 2008-01-17. ^ a b c Randi 1989, p. 141. ^ Lane, Liz (November 25, 2011). "Church tells HIV patients to stop treatment". Sky News. Archived from the original on November 26, 2011. ^ Robert Cogan (1998). Critical Thinking: Step by Step. University Press of America. p. 217. ISBN 978-0-7618-1067-4. ^ "D.A. Carson: Biographical Sketch". Monergism.com. Portland, OR: Christian Publication Resource Foundation. Retrieved 2014-01-23. ^ a b Carson 1987, p. 156. ^ Carson 1987, pp. 174–5. ^ Gaffin 1979, pp. 113–4. ^ Gaffin 1979, p. 114. ^ "Some Thoughts about Faith Healing". www.quackwatch.com. Retrieved 2016-04-07. ^ a b c d "Faith healer dies – Victim of bulbar polio". Daily Courier. Yavapai County, AZ. December 18, 1956. Archived from the original on January 29, 2013. Retrieved 2007-11-12. ^ Davis, Mike (February 8, 1956). "Lost faith: Mother's story of healer". The Miami Daily News. Miami, FL. p. 7A. Retrieved 2014-01-23. ^ "Charges against Texas faith healer dismissed". St. Petersburg Times. St. Petersburg, FL. February 21, 1956. p. 9. Retrieved 2014-01-23. ^ "Derren Brown: Miracles For Sale was deceptively entertaining polio". Metro. April 25, 2011. Archived from the original on February 15, 2013. ^ Merrick, Janna C. (2003). "Spiritual healing, sick kids and the law: Inequities in the American healthcare system". American Journal of Law & Medicine. 29 (2–3): 269–99. PMID 12961808. ^ "Definitions of Child Abuse and Neglect" (PDF). Child Welfare Information Gateway, Children's Bureau, Administration for Children and Families, U.S. Dept. of Health and Human Services. April 2007. Archived from the original (PDF) on 2007-10-11. Retrieved 2009-02-27. ^ Living on a Prayer: Why Does God Kill So Many Children in Idaho? ^ "US 'prayer cure' couple lose appeal over child's death". BBC News. July 3, 2013. Bosworth, Fred F. (2001) [First published 1924]. Christ, the healer: sermons on divine healing. Grand Rapids, MI: Revell. ISBN 978-0800757397. Carson, Don (1987). Showing the Spirit: A Theological Exposition of 1 Corinthians 12–14. Grand Rapids, MI: Baker Book House. ISBN 978-0801025211. Eddy, Mary Baker (1910) . Science and Health with Key to the Scriptures (Concord Express online ed.). sentinel.christianscience.com. Gaffin, Richard (1979). Perspectives on Pentecost: New Testament Teaching on the Gifts of the Holy Spirit. Phillipsburg, NJ: Presbyterian and Reformed Publishing. ISBN 978-0875522692. Hall, Harriet (19 November 2013). "Faith Healing: Religious Freedom vs. Child Protection". Science-Based Medicine. Retrieved 24 October 2016. Nolen, William (1975). Healing: A Doctor in Search of a Miracle. Random House. ISBN 978-0394490953. Randi, James (1989). The Faith Healers. Prometheus Books. ISBN 978-0879755355. Thomas, Northcote Whitbridge (1911). "Faith healing" . In Chisholm, Hugh (ed.). Encyclopædia Britannica (11th ed.). Cambridge University Press. Sims, Patsy (1996). Can Somebody Shout Amen! : Inside the Tents and Tabernacles of American Revivalists. University Press of Kentucky. ISBN 978-0813108865. Young, Brigham (1941). Discourses of Brigham Young. Selected by Widtsoe, John A. Young, Brigham (1997). Teachings of Presidents of the Church: Brigham Young (lds.org online ed.). The Church of Jesus Christ of Latter-day Saints (LDS). pp. 251–9.